Good news, friends! Now two Biotech’s patients, Vitaliy and Sergiy. left hospital and went home to recuperate and restore. Both have successfully undergone complicated surgeries on their legs, and both started the main stage of treatment, in which the bones re-grown from their own cells, have to strengthen and accustom in their places. Vitaliy , a volunteer with OUN Battalion, have had over 7 cm of the thigh bone defect compensated. For this, doctors at ilaya clinic labs had made a bone block and filled it with 3D gel inhabited by the patient’s cells, in advance. The bone was fixed with the help of a plate and the external fixation apparatus. This structure will hold the new bone in its proper position in the next few months. Vitaliy got his severe gunshot wounds in April, 2015 near Pisky village, where he was taken captive by militants. After his release he was treated in military hospitals in Odesa and Kyiv. Unfortunately, conventional methods did not help to get his thigh bone fused; besides, the leg was shortening and the bone getting continually ruined by osteomyelitis. Luckily, bioengineering technologies give a chance to avoid exhausting lifetime maim, and Vitaliy took advantage of it! It must be said the cost of treatment frightened him a bit as the guy had fought as a volunteer and did not have either a combatant certificate or any privileges from the state. Almost 500,000 UAH we, volunteers of People’s Project, collected and paid for our defender’s treatment. All this became possible only because of your generosity, thanks to the donations made by not indifferent people and organizations all over the world. Sergiy got wounded in March 2015. He underwent treatment in military hospitals in Kharkiv and Kyiv which he left with shortening of the leg, non-fused fracture of the thigh and contracture of the tibia. Apart from this, due to the damaged nerve the joint became non-operational, and the foot just hang down lifelessly. Sergiy joined the Biotech in November 2016. Doctors attached the stretching apparatus to the leg of the wounded pioneer, performed fusion of the ankle, and took the cell material. 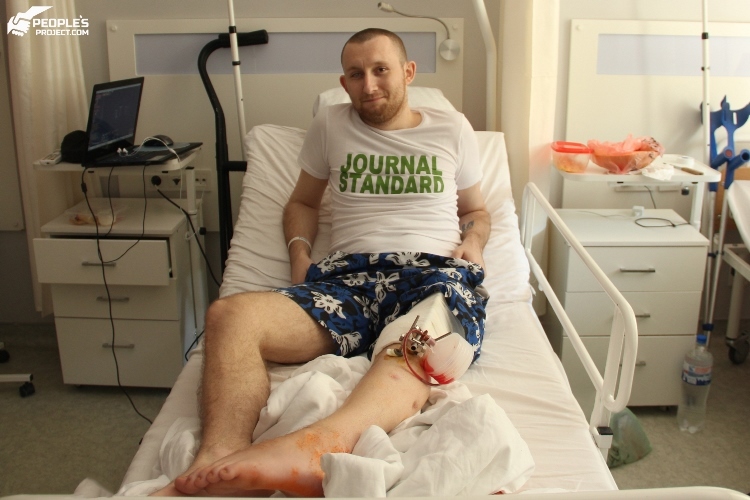 At the beginning of the month Sergiy got a bone block and 3D gel inhabited with his own cells, transplanted into the defect area, and fixed with a plate. The situation very alike to Vitaliy’s case, so the guys had plenty of things to talk over and mock each other cheerfully! Both patients’ wounds are getting healed fast, so the doctors have already sent them home to restore under their remote observance. Next time they are going to visit the clinic for a routine testing and x-ray. Then the time to estimate the results of the performed surgeries will come. Meanwhile, the Bioengineering Rehabilitation for Wounded project gets new patients, and we are going to tell you about them soon. Besides, there are fighters who need your support, among those wounded who are undergoing treatment right now. Specifically, we are raising funds for treatment of Petro – fellow pioneers consider his case a real miracle as his leg damaged by an antipersonnel mine explosion, still can be saved. Also we are trying to save Volodymyr’s arm – today the bones of his forearm look like a mess which bioengineering technologies can turn into normal bones. Another fighter that needs our help is Dmytro: instead of a damaged almost non-functional limb the man will get a normal arm which is vital for a cyclist like him!